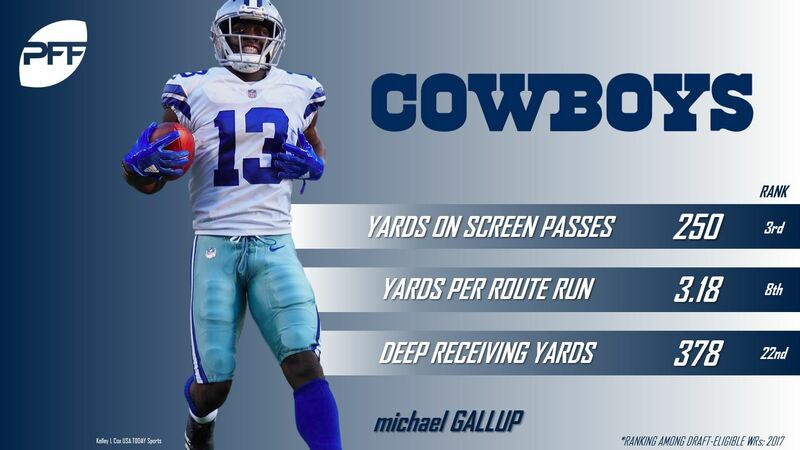 Gallup might have been the best all-around receiver in this year’s draft class, and he walked into a great situation with the Dallas Cowboys who currently lack a true number one outside receiving option. Gallup has the speed to make plays down the field, and he uses his hands well both against press coverage and at the catch point. In 2017, he faced press coverage on 64 of his targets, which was the most among wide receivers, and he caught 30 of those targets for 568 yards (8.8 yards per target). Gallup ranked 15th in yards per route in 2017 (3.18) and second in 2016 (4.34) among all wide receivers. The Cowboys could certainly use an uptick in production from the wide receiver position as no wide receiver ranked in the top 30 in yards per route run a season ago. The edge rusher position is open for competition at Giants camp opposite of veteran Olivier Vernon. Carter recorded 33 pressures in 2017, and his 15.5 pass-rush productivity rating ranked fifth among draft-eligible edge defenders. The Giants need to bolster their pass rush, as the team finished with a 61.7 overall pass-rush grade a season ago, fourth-worst in the NFL. 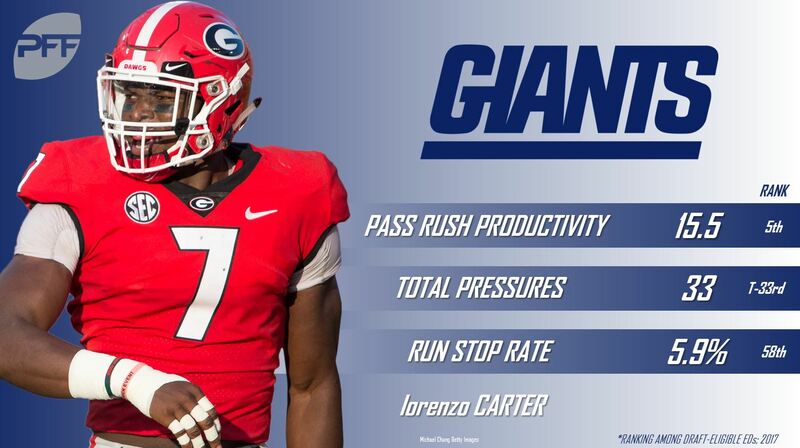 Against the run, however, Carter has room for improvement, as he posted a 5.9 percent run stop rate that ranked 58th among the edge draft class. His lack of consistency is a concern, but if he can put some added muscle on his frame and improve his techniques, he could be a solid edge player for the Giants. Sweat’s path to snaps might be difficult due to Philadelphia’s deep defensive line, but with an impressive camp he could be the next man up in Philly’s edge rotation. The rookie never quite lived up to his recruiting hype at Florida State. Over his three-year collegiate career, Sweat produced 96 total pressures and missed only five tackles. Sweat also offers balance at the position, which the Eagles covet, by stopping the run at an efficient rate. His 8.1 percent run stop rate ranked 20th among draft-eligible edge defenders. He has the opportunity to learn behind stars Brandon Graham, Fletcher Cox, and Michael Bennett along the defensive line, so Sweat has elite-level talent around him to help push his game to new levels during his rookie campaign. Payne might not be flashy, but he has the NFL-level skillset to start from day one. The rookie is comfortable performing in any alignment between the tackles without his game suffering any sort of setback. His 9.2 percent run stop rate ranked 19th among draft-eligible interior defensive linemen, and he is also a capable pass rusher, recording 33 total pressures in 2017. Look no further than the National Championship game against Georgia to see just how disruptive Payne can be, as he earned a 90.3 overall grade and generated eight total pressures. Look for Payne to wreak havoc in the opposition’s backfield throughout training camp and the preseason.